Thanks to Drs. Roopa Arora and Eman Juffairi, Salmaniya Medical Complex (Kingdom of Bahrain) for contributing this case and the discussion and Dr. Hillary Zalaznick, Myriad Genetics, Inc., Utah (USA), for editing the discussion, and Dr. Sara Shalin of our editorial board for her review. To contribute a Case of the Week, first make sure that we are currently accepting cases, then follow the guidelines on our main Case of the Week page. (2) A couple of new CME courses offered by ARUP Laboratories Institute for Learning have been posted. Most of the CME courses also offer Free SAM credit. (3) New articles have recently been posted on our Management page. 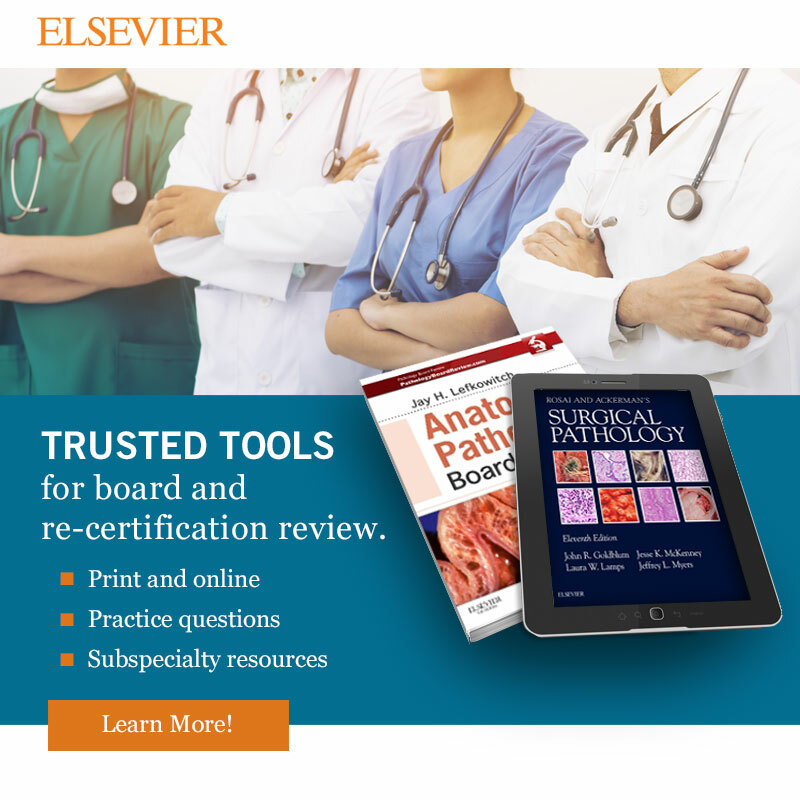 These articles are written by Vachette Pathology and include "Lab Prior-Authorization Programs Continuing to Evolve" and "What Pathologists Can Expect from the 2018 Medicare Physician Fee Schedule". A 53 year old woman presented with a painless, slow growing, right inguinal swelling for six months, clinically suspected to be an enlarged lymph node. She had hypertension, dyslipidemia and diabetes mellitus, but no fever, night sweats, loss of weight or loss of appetite. On exam, there was no generalized lymphadenopathy or organomegaly. However, a single, soft to firm, slightly mobile, non tender inguinal swelling measuring 3.5 x 2 x 1 cm was noted without significant changes of the surface of the skin. No other masses were found. Plain radiographs showed no bony lesions. Laboratory evaluations were unremarkable. Ultrasound findings suggested a lymph node undergoing cystic degeneration. Fine needle aspiration cytology (FNAC) was performed, followed by excision. The excised specimen showed an ill defined nodule covered by an ellipse of skin measuring 3.5 x 2 x 1 cm. The mass was firm with a homogenous gray white cut surface. Which of the following is not a typical feature of granular cell tumors? Granular cell tumors (GCTs) are relatively common soft tissue tumors thought to be derived from the peripheral nerve sheath. GCTs typically occur in the fourth to sixth decade, and are seen slightly more often in women. (Wick: Silverberg's Principles and Practice of Surgical Pathology and Cytopathology, 5th ed, 2015). They can arise in the dermis or subcutis, as in this case, but also along mucosal surfaces (especially the tongue), skeletal muscle and internal organs. Occasionally GCTs are multifocal (Am J Surg Pathol 1998;22:779). Their presentation as skin nodules or lymphadenopathy is likely to raise suspicion of malignancy (Coll Antropol 2010;34:261, Medical Channel 2010;16:103 - cited). Fine needle aspiration cytology (FNAC) can play a major role in preoperative diagnosis of granular cell tumor, especially in cases that present as skin nodules (Coll Antropol 2010;34:261, Medical Channel 2010;16:103 - cited, Indian J Dermatol 2012;57:330, Acta Cytol 2001;45:263). In this case, the FNAC smears were highly cellular and composed of syncytial clusters and many scattered single, fairly uniform cells, some with naked nuclei. The cells had abundant granular cytoplasm, with eccentric round-to-oval vesicular nuclei and prominent nucleoli. No mitoses or necrosis was observed. Except for the nuclear features (discussed further below), the cytology findings were consistent with a granular cell tumor. In addition to these cytomorphologic features, rare intracytoplasmic pseudoinclusions can also be seen in GCTs (Cibas and Ducatman: Cytology: Diagnostic Principles and Clinical Correlates, 4th ed, 2014). The excisional biopsy showed a non encapsulated lesion with nests, clusters and sheets of epithelioid-like tumor cells in the dermis, extending focally to subcutaneous fat (figure 3). The cells were large, round to polygonal, with abundant granular eosinophilic cytoplasm. The nuclei were round to oval, centrally or eccentrically located and vesicular with conspicuous nucleoli (figure 4). Rare mitoses were noted but no evidence of necrosis was observed. The overlying epidermis was atrophic. No epidermotropism or pagetoid spread of tumor was seen. Because of the nuclear features, this tumor was classified as an atypical GCT. Typical GCT nuclei are smaller, with finely granular chromatin and less prominent nucleoli (Cibas and Ducatman: Cytology: Diagnostic Principles and Clinical Correlates, 4th ed, 2014). Other histologic features that can be seen in GCT are overlying squamous hyperplasia and a markedly collagenized stroma (Wick: Silverberg's Principles and Practice of Surgical Pathology and Cytopathology, 5th ed, 2015). The vast majority of GCTs are benign, but as many as 2% may be malignant (Wick: Silverberg's Principles and Practice of Surgical Pathology and Cytopathology, 5th ed, 2015). In an attempt to define criteria for malignancy, Fanburg-Smith et al analyzed 73 GCTs for 6 histologic features: presence of necrosis, presence of spindled tumor cells, vesicular nuclei with large nucleoli, mitotic rate >2 per 10 hpf, high N:C ratio, and pleomorphism. Tumors that went on to metastasize met three or more of these criteria; however, not all of the cases that met three or more criteria metastasized. Cases that met one or two of the criteria were considered “atypical,” although they all followed a benign clinical course (Am J Surg Pathol 1998;22:779). 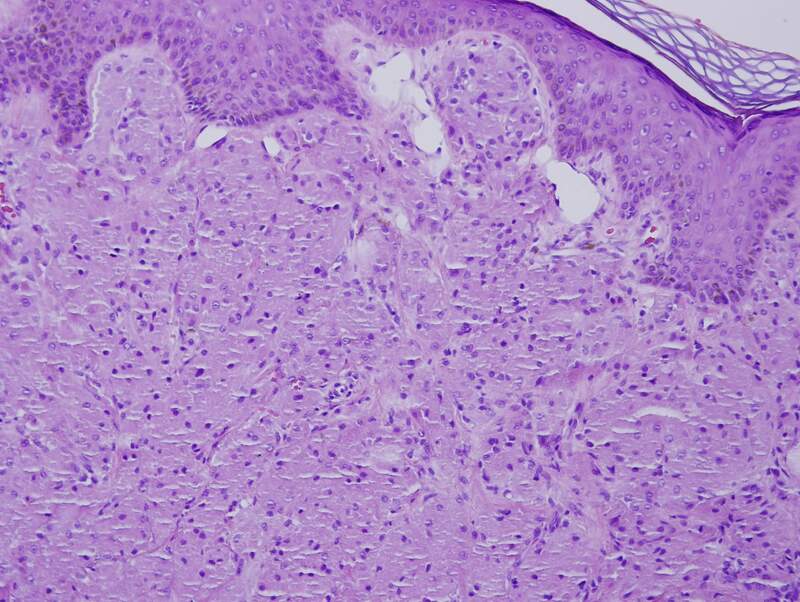 The current case shows cells with vesicular nuclei and prominent nucleoli, and hence was diagnosed as an atypical GCT. Benign, atypical and malignant GCTs are strongly S100 positive and can be positive for other melanocytic markers such as MiTF (Cibas and Ducatman: Cytology: Diagnostic Principles and Clinical Correlates, 4th ed, 2014) and SOX10 (Hum Pathol 2014;45:1039), but are negative for HMB45. GCTs can also be positive for TFE3, inhibin and calretinin. PAS-D and CD68 are positive in the cytoplasmic granules, which are due to lysosomes (Hum Pathol 2014;45:1039). The tumor cells are negative for muscle markers, GFAP and cytokeratins (Cibas and Ducatman: Cytology: Diagnostic Principles and Clinical Correlates, 4th ed, 2014). 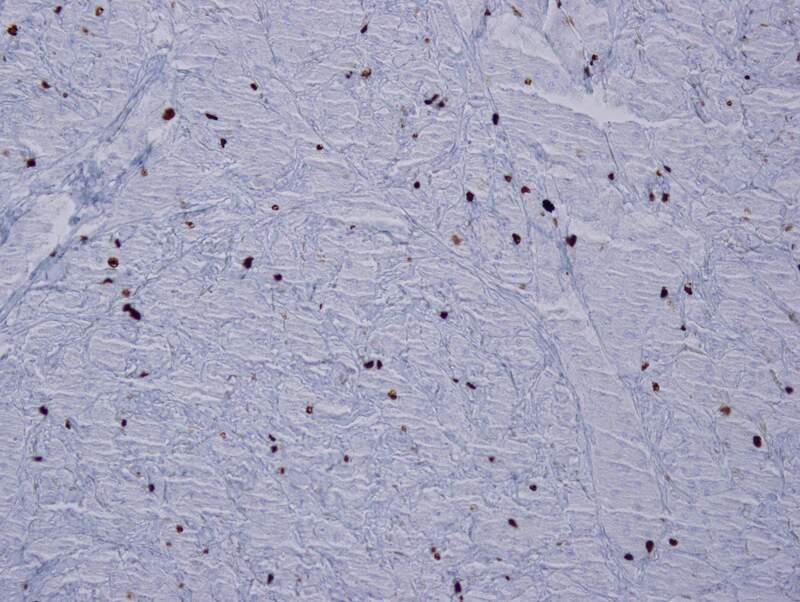 In the current case, the tumor cells stained positively for S100 protein (figure 5), CD68 (figure 6), neuron-specific enolase (not shown) and vimentin (not shown). Ki67 was 2% (figure 7), which is just slightly elevated compared to the 1% or less seen in Fanburg-Smith et al (Am J Surg Pathol 1998;22:779). The current case was nonimmunoreactive for AE1/AE3, SMA, desmin, HMB45 and CD34 (not shown). 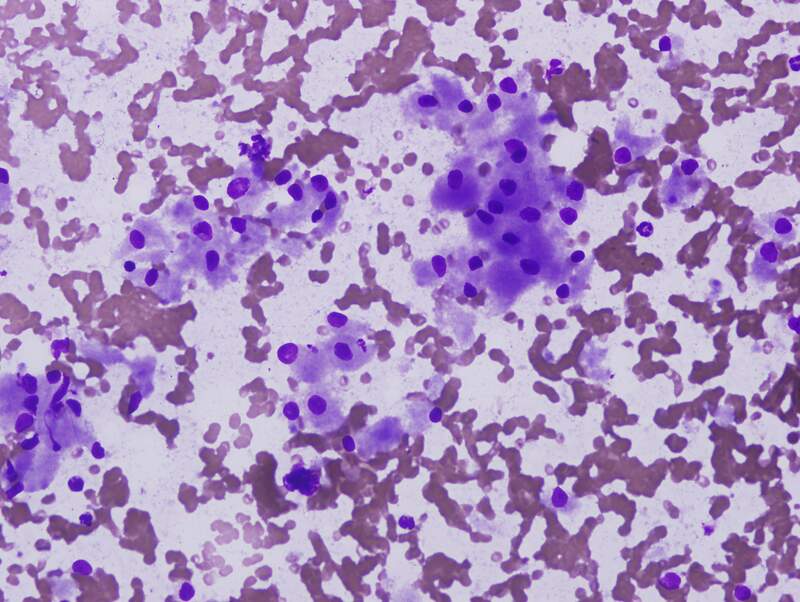 The differential diagnosis of GCT on FNAC can range from benign or reactive to neoplastic entities, and therefore cytopathologists should be aware of the characteristic cytological features of this tumor (Coll Antropol 2010;34:261, Medical Channel 2010;16:103 - cited). Fat necrosis and other inflammatory processes with abundant histiocytes are also in the differential diagnosis of GCT. 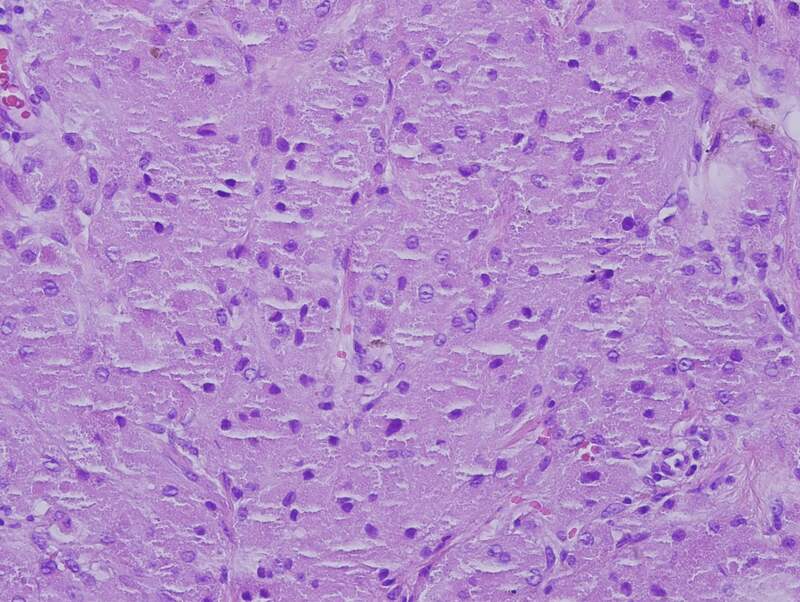 The polygonal cells and fragile granular cytoplasm can often be mistaken for histiocytes and necrosis, as seen in atypical infections, granulomatous inflammation and other benign nonneoplastic entities such as fat necrosis (Acta Cytol 1999;43:552; J Am Sci 2011;7:188). However, histiocytes typically show ingested debris and have bean shaped nuclei. Neoplastic lesions considered in the differential diagnosis of GCT on FNAC include rhabdomyomas, fibroxanthomas, oncocytic neoplasms, alveolar soft part sarcoma (ASPS) and metastatic renal cell carcinoma (JCytopathology 2005;16:259). This is primarily due to the granular nature of their cytoplasm. On histology, granular cell variants of squamous cell carcinoma, melanoma and smooth muscle tumours are also considered in differential diagnosis in addition to those mentioned above. 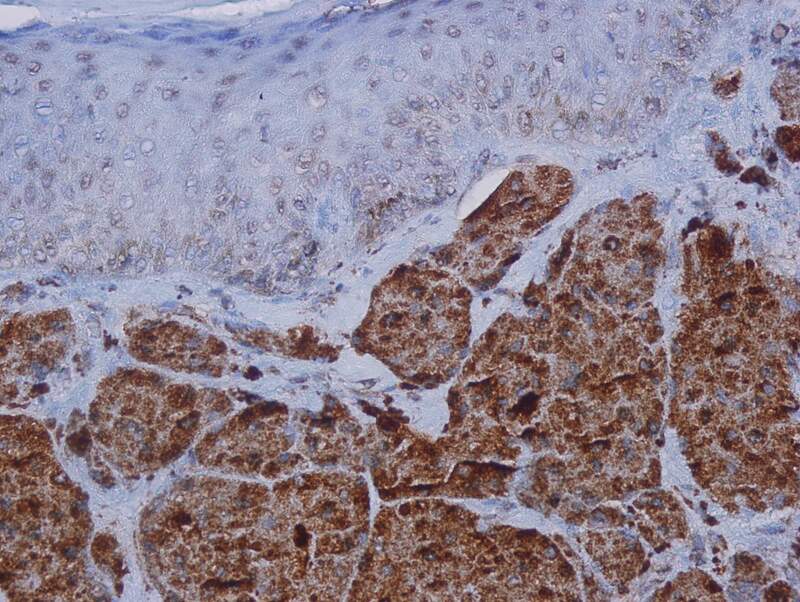 However, an accurate diagnosis can be reached by characteristic morphology and immunostaining of the tumour, that is, positive staining with S100, CD68, NSE and vimentin as was done in this case. One important differential diagnosis that should be excluded in this case is alveolar soft part sarcoma (ASPS), which also displays nests of large cells with finely granular, eosinophilic cytoplasm and round nuclei. Both entities are positive for TFE3 (Hum Pathol 2014;45:1039). 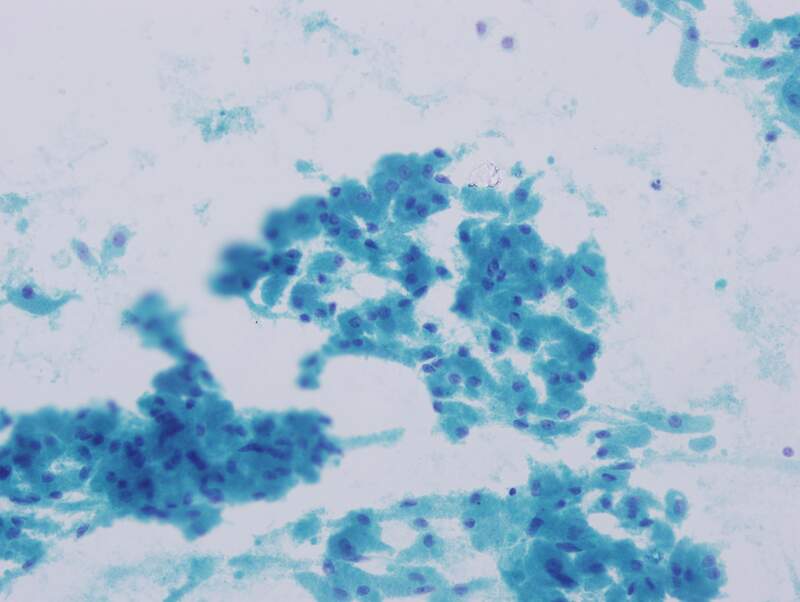 FNA smears of ASPS can show naked nuclei and fragile granular cytoplasm, like GCTs (Cibas and Ducatman: Cytology: Diagnostic Principles and Clinical Correlates, 4th ed, 2014). However, ASPS tends to affect younger patients, and the cells have more prominent nucleoli than those of GCTs. ASPS also typically shows a pseudoalveolar arrangement of tumor cells and cytoplasmic PAS/PAS-D+ rhomboid crystals in “sheaf-like” aggregates (Wick: Silverberg's Principles and Practice of Surgical Pathology and Cytopathology, 5th ed, 2015). 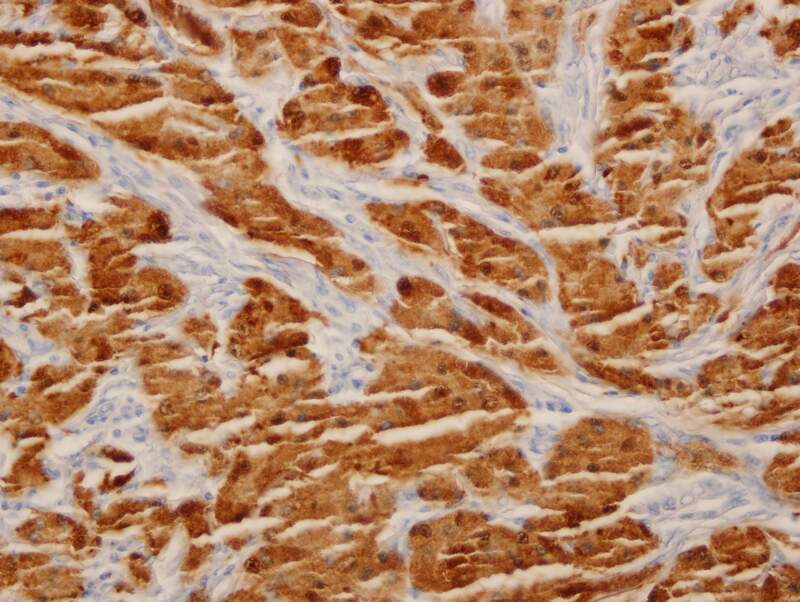 Additional considerations are rhabdomyoma, which would have cytoplasmic cross striations and would be S100 negative; and renal cell carcinoma, which can be excluded with immunohistochemistry (e.g., PAX8). In the current case, the tumor extended to one lateral resection margin, and a wide local excision was advised. The re-excised specimen revealed one focus of tumor measuring 0.8 cm, with clear resection margins. Per Fanburg-Smith, this tumor is unlikely to demonstrate malignant behavior (Am J Surg Pathol 1998;22:779) and so this patient’s prognosis is excellent. 1. Loncar B, Marjanovic K, Pauzar B, Staklenac B. Granular cell tumor-clinically presented as lymphadenopathy. Coll Antropol 2010;34:261. 2. Agarwal A, Sinha A, Rijal A, Karki S, Nizamani SM. Cytology diagnosis of granular cell tumor of umbilicus mimicking metastatic skin nodule and review of literature. Medical Channel 2010;16:103 (cited). 3. Singh A, Sawhney M, Das S. Granular cell tumour of skin diagnosed by fine needle aspiration cytology. Indian J Dermatol 2012;57:330. 4.Mallik MK, Das DK, Francis IM, al-Abdulghani R, Pathan SK, Sheikh ZA, et al. Fine needle aspiration cytology diagnosis of a cutaneous granular cell tumor in a 7-year- old child. A case report. Acta Cytol 2001;45:263. 5. Liu K, Madden JF, Olatidoye BA, Dodd LG. Features of benign granular cell tumor on fine needle aspiration. Acta Cytol 1999;43:552. 6.Hassan AM, Khamis NN, Hammam MM. Role of fine needle aspiration cytology in diagnosis of soft tissue tumors. J Am Sci 2011;7:188. 7. Rossi ED, Mule A, Miraglia A, Cianfrini F, Zannoni GF, Fadda G. Granular cell tumour on conventional cytology and thin-layer smears. JCytopathology 2005;16:259. 8. Fanburg-Smith JC, Meis-Kindblom JM, Fante R, Kindblom LG. Malignant granular cell tumor of soft tissue: diagnostic criteria and clinico pathologic correlation. Am J Surg Pathol 1998;22:779. 9. Sonobe H, Iwata J, Furihata M, Moriki T, Ohtsuki Y: Malignant granular cell tumor: report of a case and review and the literature. Pathol Res Pract 1998;194:507. 10. Kataoka A, Koike M, Kuranuki K, Wakayama K, Yamada S, Akasaka Y: A case of malignant granular cell tumor arisen in the chest wall. J Jpn Surg Assoc 2005;66:2403 (in Japanese with English abstract). 11. Nasser H, Ahmed Y, Szpunan SM, Kowalskia PJ. Malignant granular cell tumor: A look into the diagnostic criteria. Pathol Res Pract 2011;207:164. A. Prominent, cherry red nucleoli are not a feature of benign GCT. Prominent nucleoli should prompt exclusion of malignancies such as alveolar soft part sarcoma.